Spectos GmbH is an independent market research and technology institute. 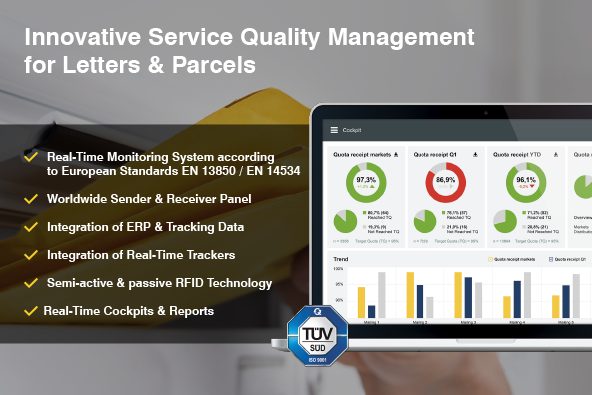 As a market leader, Spectos offers real-time performance management solutions to postal and logistics services. Headquartered in Dresden, Germany, Spectos is specialized in measuring postal service quality according to international standards, EN 13850 and EN 14534. Among many of its clients who call upon Spectos for their expertise in the postal sector are Postcon, bpost, Lux Post, PostNL and Singapore Post. Using cutting edge technologies such as real-time trackers and passive and semi-active RFID, Spectos has specialized in delivering independent measurements for clients’ Quality Management Systems and Certifications. With its in-house support and letter centers, Spectos ensures top quality results for the deployment of state-of-the-art survey methods. Further services in the postal segment include video coding and redress management. As with everything at Spectos, the company has a focus on holistic approaches in supporting clients in improving their processes and services. Founded in 2001 by Niels Delater, Spectos has been providing industry leaders with individual and customized solutions for nearly two decades. With this profound experience in the market research industry and a leading presence across the globe, Spectos delivers customers with eye-opening data they need to sustainably improve customer satisfaction and build customer loyalty. By providing highly effective SaaS & PaaS solutions based on the Six Sigma methodology. Spectos delivers a dependable framework for measuring, sharing, and acting on customer & employee feedback throughout entire organizations. With rich & responsive data representations, insightful cross-location comparisons, role-based data access, automated notification systems, and modern social media filters, Spectos provides its users with a centralized platform for valuable omni-channel customer data. The platform is enhanced by dedicated project management teams, panel services & multi-language support to build and maintain large scale projects for multinational organizations. Check out our dedicated page to Post & Logistics here.